I pulled some elements from the outer images….gingham, floral, the bird….and my friend Denise inspired me to use this SAB set from last year after I saw her card here! Thanks, Denise! It had been on my mind and she gave me the little push I needed! I also used the RetroSketches sketch#59—so fun! I love this card so much, I don’t want to mail it out….but it is already on its way to a special someone who did something REALLY nice for me! Thanks for visiting today! Any questions….pop me an email! Cassidy was playing with tattoo markers (blessedly, they wash right off!) while I answered the phone yesterday…..and while I was distracted, she gave herself a couple of teeny tiny facial decorations…..and this is right after a bath, no less!!!! Can you see them? They’re so nice & evenly spaced…and no, they’re NOT pink!!! She’s covering her mouth because she used the pink one on her LIPS! Love this, Leanne! Great combinations of pattern and texture, and I love gingham! OH my were have I been? I have miss all these lovely cards and sweet Cassidy pictures. Beautiful cards this week LeAnne. I love you Merry Monday card. Such a sweet image. You know I love the vintage images you find. So sad that you lost it. I am work at the Milwaukee Stamping Expo this weekend. Two long days. I how I have enough energy. OMG LeAnne, I love your red card. You are a blue girl, I am a red girl. Love love love it. Glad I am getting your posts again. The innocent look on Cassidy's face is priceless. I would love to have that house. I subscribe to your blog - and I look for Cassidty picture every day - I am glad you are back - you are the first thing I open up every morning to see what the little munchkin is up to - a little marker is a very cute idea! Fab card. Love the gingham and your take on the inspiration photo. Love it LeAnne! It is much prettier than my take on the card, its just beautiful! Oh my those eyes say it all! I'm so glad the markers wash off easily. Your card is beautiful. I love the red and white. Love the checkered DP (or did you stamp that to create the DP?) The flowers are so pretty here too. 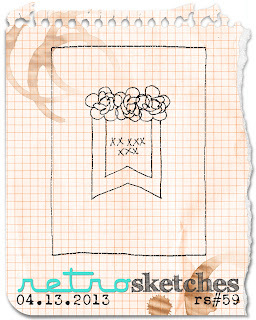 I must make time to try this great sketch. The photo is gorgeous and so is your card! You are amazing how you just keep hitting them out of the park! I am going to call you Babe from now on! Absolutely gorgeous, LeAnne! I LOVE red and cream together. And I love the pretty, swirly floral with the gingham and polka dots. The row of pretty flowers at the top is the perfect finishing touch. Well done, my friend! 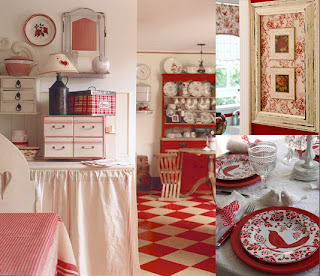 The red and white look so welcoming, bright and cheery! Just gorgeous! This card makes me happy!